Authentic and real imagery. 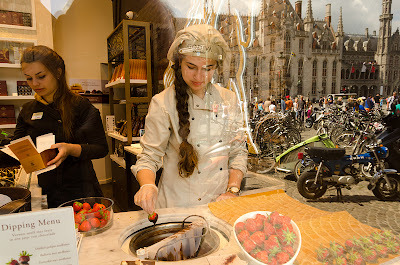 Chocolate in Brugge. We're all rather cynical these days about advertising promises and can spot an image that's fake a mile away. What does this mean for brands and companies that want to advertise to us and the images they choose? And on the flip side what does the demand for real emotions and real imagery mean for photographers? Studies have shown that people are far more positive toward an advert with an emotionally powerful and authentic image than one that looks like a set-up studio piece or standard stock image. Getty commissioned independent research from the agency Brainjuicer in the UK and used a sample of 600 people to test a set of three adverts. One advert used an image that was authentic and emotionally powerful, the second advert was a standard stock type commercial image and the third advert only contained text. The results show a far more positive attitude by the public toward authentic, emotionally powerful images. In other research conducted by IPA DataMINE it was shown that emotional campaigns, as well as improving brand awareness and commitment to buy, were also more effective in achieving typically 'hard-to-achieve' positioning and perception elements such as fame, quality, trust and differentiation. So what does this mean for photographers. Without going into all the nitty gritty of the results of various experiments, I'll cut to the chase. Authentic images that show real emotions are going to be increasingly sought by brands and companies. The reason is that brands are beginning to realise that overly manipulated 'fake' images and images that are clearly and obviously 'set up' and created to market products do not appeal to people. You and I apparently want to see real people, real situations and real emotions. Photographers still need to shoot with high production values. Technical quality, good lighting and complete control over every aspect from location to casting is essential. However the key to success will be to create a situation where real emotion can flow, that looks authentic but does not look absolutely perfect in every sense - there has to be a slightly random element, which we term 'perfectly imperfect'. Professional photographers know that to produce an image that at a glance may look like a spontaneous snap, takes an extraordinary amount of work but this is the type of image we should be striving for so forget about your overly manipulated and clearly Photoshopped images.If you want to succeed, keep it real. Our audience will relate to and identify with images that are real, authentic and emotionally powerful.